Hello friends! For those of you that celebrated Thanksgiving this past week I hope it went well. 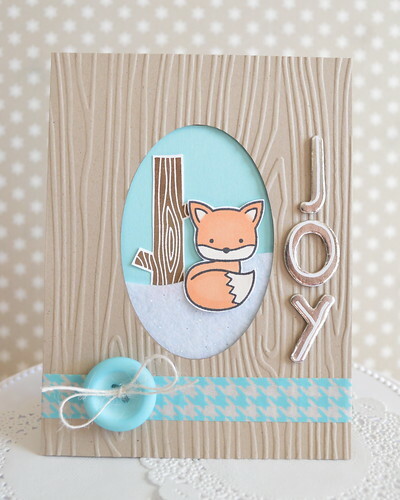 Today I have a card to show you using Lawn Fawn stamps that I created for the Lawn Fawn 2014 CHA Catalog Challenge! To create my card I used "Into The Woods". There are a lot of "fox" out there, but this one is my favorite without a doubt. I gave my fox a snow bank to sit in using white glitter felt that I picked up at Hobby Lobby. I cut it free hand. Easy peasy! I added chipboard letters, and some super cute hounds tooth washi tape. I hope you like my card! Thanks for stopping by! I just love what you created with this set! The woodgrain and the letters look so pretty! the color combo on this is gorgeous! I love the neutrals with the pop of light teal!